This is a broad portfolio and the improvements we can offer are almost endless. This can be simple items like implementing a planting schedule or improving the gradient of a bank. We can provide an extensive range of improvements for your watercourse, some of the more common projects are detailed below. These are often constructed in association with silt traps and are most commonly installed on lakes and ponds that receive water from a river or stream, which of course brings sediment. 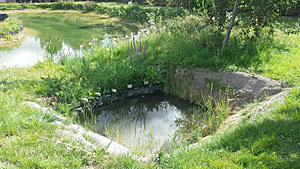 A well-designed silt trap and filter bed can reduce the accumulations of silt in the watercourse by as much as 90% although this will of course have to be maintained. Reed bed filters are also commonly used for improving water quality where the run off might include farmyard waste, grey water or from surface inlets in a SUDS system. Reed beds are an attractive green improvement that enhance the watercourse. Rivers and streams regularly become heavily silted reducing the habitat value, especially for species that rely on gravels to reproduce, such as trout. Gravel can be cleaned however; flow engineering can speed water up in the right way to ensure that clean gravels are present all year round. 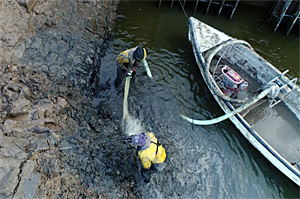 Like most river works this is regulated by the Environment Agency and requires formal consent to be given. We are up to date with the current legislation and our staff have been beta users in the introduction of the new consenting process. This gives a small taste of the scope of the work we can offer, if you would like any improvements undertaken, please do get in touch.